Now in his mid-forties, after years of apathy, selfishness, and using his X-Ray-Vision on lottery scratch-offs, Barry Glick is once again goaded into action when a Homeland Security agent disappears. Barry is reluctant to relinquish his simple life of frozen pizza and fruity beers, but when his sidekick’s redheaded sister is involved, he weakens as much as that other guy around Kryptonite. Barry stumbles into a situation much more dire than a simple kidnapping; he uncovers a massive conspiracy to collapse the world’s financial system and bring about a modern day Apocalypse. And he’s the only one who can stop it. Paperback $13.99 plus $1 shipping. Hardcover $20.99 plus $1 shipping. 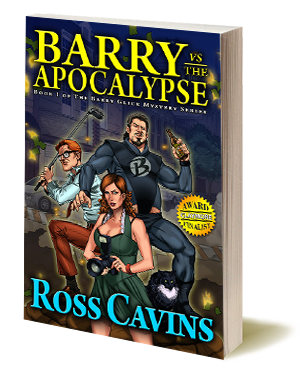 “Ross has a twisted mind, but you are in for a ride if you climb aboard the Barry train. A super hero thats not that super, he has his flaws. That’s what makes him interesting.